Measurement of the bending stiffness a healing fracture represents a valid variable in the assessment of fracture healing. However, currently available methods typically have high measurement errors, even for mild pin loosening. Furthermore, these methods cannot provide actual values of bending stiffness, which precludes comparisons among individual fractures. Thus, even today, little information is available with regards to the fracture healing pattern with respect to actual values of bending stiffness. Our goals were, therefore: to develop a measurement device that would allow accurate and sensitive measurement of bending stiffness, even in the presence of mild pin loosening; to describe the course of healing in individual fractures; and help to evaluate whether the individual pattern of bending stiffness can be predicted at an early stage of healing. A new measurement device has been developed to precisely measure the bending stiffness of the healing fracture by simulating four-point-bending. The system was calibrated on aluminum models and intact tibiae. The influence of pin loosening on measurement error was evaluated. The system was tested at weekly intervals in an animal experiment to determine the actual bending stiffness of the fracture. Transverse fractures were created in the right tibia of twelve sheep, and then stabilized with an external fixator. At ten weeks, bending stiffness of the tibiae were determined in a four-point-bending test device to validate the in-vivo-measurement data. In-vivo bending stiffness can be measured accurately and sensitive, even in the early phase of callus healing. Up to a bending stiffness of 10 Nm/degree, measurement error was below 3.4% for one pin loose, and below 29.3% for four pins loose, respectively. Measurement of stiffness data over time revealed a significant logarithmic increase between the third and seventh weeks, whereby the logarithmic rate of change among sheep was similar, but started from different levels. 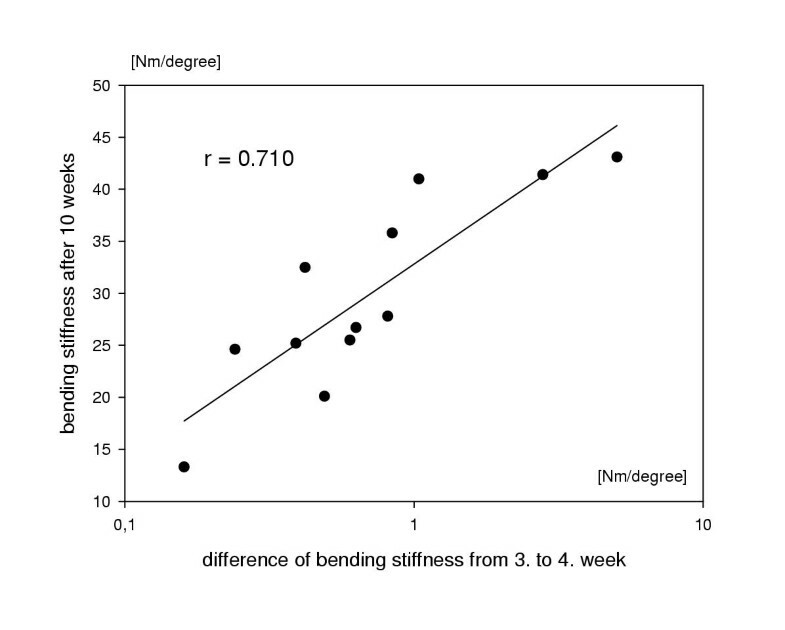 Comparative measurements showed that early individual changes between the third and fourth weeks can be used as a predictor of bending stiffness at seven weeks (r = 0.928) and at ten weeks (r = 0.710). 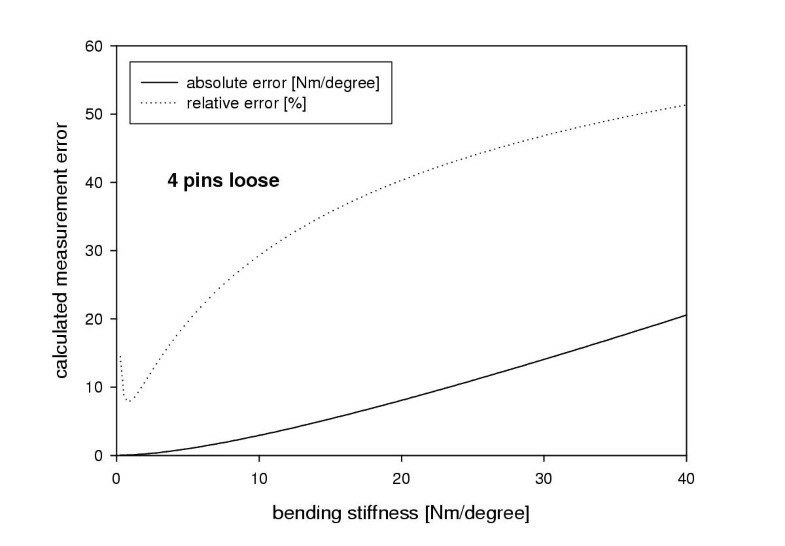 Bending stiffness can be measured precisely, with less error in the case of pin loosening. Prediction of the future healing course of the individual fracture can be assessed by changes from the third to the fourth week, with differences in stiffness levels. Therefore, the initial status of the fracture seems to have a high impact on the individual healing course. Treatment of open, complex fractures with severe soft tissue injury or infection is a generally accepted indication for the use of external fixation. However, one of the main complications, typically unexpected, is the development of a delayed union. Conventional radiographs often do not allow early assessment or prediction of this complication, since conclusive information regarding callus maturation may be difficult to obtain [1, 2]. Furthermore, radiological assessment from plain radiographs often is insufficient to accurately predict the strength of a healing fracture, even under experimental conditions [3–6]. The need for reliable methods to assess the stage and progress of healing is evident. Experimental and clinical evaluations of direct, indirect, invasive and non-invasive mechanical measurements of the healing fracture have been published [7–19]. In all of these studies, a mechanical measurement of fracture stiffness was performed using a load at the fracture site while simultaneously measuring displacement of the bone fragments across the fracture. Changes over time in the relationship of measured load to displacement served as an indicator for fracture healing. One of the first authors describing a method to measure bending stiffness of the healing fracture was Jernberger in 1970 . He inserted pins into the tibia and performed measurements in three-point-bending. The measurements obtained were accurate, but the invasive procedure of inserting pins through intact skin onto the bone for every measurement is not a method of choice, due to the risk of infection and patient discomfort. Churches et al. and Kenwright et al. developed a systematic approach to external fixator biomechanics. They calculated the structural properties of their external fixator and used these data to calibrate the individual external fixator of the patient. Two types of tests were applied: measurement of axial stiffness and measurement of bending stiffness. Measurement of bending stiffness was performed by raising the leg straight with the patient in a sitting position  or by loading the limb manually while measuring the resulting loads at the heel [21–23]. When the axial stiffness of the fracture reached 1000 N/mm2 or the bending stiffness reached 15 Nm/degree, the external fixator was removed. Using these values as the threshold to remove the external fixator in clinical studies, no refracture or loss of reduction was reported [16, 17, 24]. Based on the results of these measurements, the authors stated that bending stiffness rather than axial stiffness best represents the state of the healing fracture. However, measurement of bending stiffness over the external fixator is limited in case of pin loosening, which can be assumed to be of higher incidence with a longer healing time. The error in measurement has been reported to be 20% if one pin and 50% if two pins became loose . Additionally, positional set-up measurement errors have been found to be up to 22% in a test probe having a bending stiffness of 10 Nm/degree . Therefore, pin loosening remains the most limiting factor in measurement of the fracture stiffness. Little information is known about the influence of the early development of bending stiffness on the later stage of healing. In previous investigations, different courses of the individual progress of fracture healing have been described [23, 27]. However, the idea that early changes in stiffness, if measured accurately, can be used to predict which fracture will heal normally and which will experience delayed union has not been experimentally confirmed. The objective of our study was to improve the measurement of bending stiffness with special regard to changes in the early healing phase. Furthermore, a comparison among the individual fracture healing courses was made to test if early changes of the bending stiffness can be used to determine the success of healing at a later stage. All experiments reported here were authorized and registered as number GR 26/19 83 (in accordance with Swiss federal law on animal experiments) and have been approved by the Davos animal care committee. Studies were carried out on 12 adult mature sheep (over 6 years of age). Under general anesthesia with fluothane (Halothane®) and using sterile surgical techniques, the midshaft of each tibia was exposed. A thin saw cut of a 3 mm depth was applied midshaft to weaken the bone and to avoid complex fracture. A transverse fracture was then created midshaft using a C-shaped instrument applying three-point bending. The anterior aspect of the bone was put under tension to create a 3 mm wide defect. A unilateral fixator based on a standard AO tubular fixator (Synthes AG, Switzerland) with four half-threaded 4.5 mm pins was applied – two screws on each side of the fracture. The fixator was mounted with equidistant pins (40 mm) on the anterior aspect of the tibia. At the animal facility, the sheep were protected against overloading the fracture by a loosely adapted harness in which they could lay down to rest or sleep. With this system, during standing no external support was provided, but high torsional forces were prevented while standing up and laying down. The sheep were sacrificed at 10 weeks post surgery with an intravenous injection of sodium pentobarbital (Vetanacol®). Their hind limbs were disarticulated at the knee, and carefully dissected free of muscle and fibrous tissue without damage to the callus. The ends of each bone were embedded in blocks of methylmethacrylate, which covered the four pin holes in order to prevent stress concentration during biomechanical testing. The central portion of the diaphysis, including the fracture side, was wrapped with towels soaked in Ringers solution to prevent drying while the methylmethacrylate polymerized. After embedding, the specimens were frozen at -20°C until mechanical testing. In a former experimental study , we used a prototype of the measurement device in an animal model. The custom-made instrument for measuring the bending stiffness consisted of a U-frame that could be attached to the external fixator pins (Fig. 1). On both sides of the fracture, a rigid reversed U-profile was mounted on the two pins of each fragment. The clamps of the instrument were fastened to the pins, similar to a unilateral fixator. At the lower part of the U-frame, the junction bars of the instrument were connected to each other by two flexible blades, instrumented by strain gauges and functioning as angular displacement transducers (Fig. 1). The height of the instrument was positioned so that the central axis of the bone was in one plane with both goniometric blades (Fig. 2). To achieve this position, a postoperative radiograph was taken with the center beam exactly at the center of the gap, perpendicular to the plane of the external fixator. The distance from the outer surface of the proximal inner fixation clamp of the external fixator to the central axis of the bone was subtracted from the height of the measurement device. For each animal, a spacer of this distance was fabricated and slipped over the inner proximal pin to assure reproducible positioning of the measurement device. In-vivo-measurement device of bending stiffness. The design of this instrument allows for both the application of an almost pure bending force to the fracture and the simultaneous assessment of the force versus angular displacement relationship with a very small amount of angular displacement. The device is applied to the external fixator pins and the longitudinal rod is removed. Principle drawing of the bending stiffness measurement device. The measurement device is adjusted to the external fixator, aligning the longitudinal rod of the device with the neutral axis of the bone, and the strain gauges (rotational center) positioned at the fracture site. The longitudinal rod of the external fixator is then removed. When applying compressive or distractive forces between the clamps on each side, the measurement device bends through the center of the fracture, producing a four-point-bending moment between the inner pins. 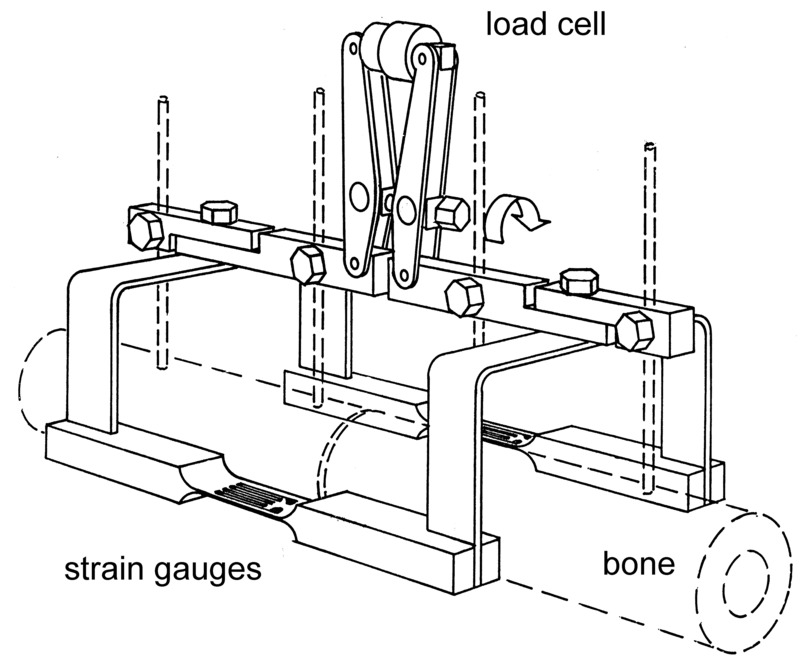 The angular deflection is measured by means of strain gauges. At the upper part of the measuring instrument, between the two clamps, a tension device containing a load cell allowed the application of a force approximating or separating the clamps of the device, while measuring resulting load. The two longitudinal goniometric blades were connected in parallel to a bridge amplifier. During measurement, load and deformation was simultaneously recorded on an x-y plotter. Once the measuring instrument had been mounted on the pins, the longitudinal bar of the external fixator was removed and the bone fragments were hold exclusively by the measurement device without loss of reduction. Although the measuring device was flexible in bending along the axis perpendicular to the external fixator pins, it was still stiff enough to maintain the reduction. Using the tension device, a small load, up to approximately +/- 10 N, was carefully applied to prevent breakage of the new formed interfragmentary tissue. Angulation of the bone fragments due to loading was below 0.5 degrees. Tension and compression versus angular deformation of the longitudinal bars was measured and served as an indicator of healing (Fig. 3). At each measurement, the longitudinal bar of the external fixator was remounted and the measurement device removed. Example of raw measurement of bending stiffness. Changes in load (x-axis) versus angular deformation of the measurement device (y-axis) represent "apparent" bending stiffness (N/microstrain). On the left side, bending stiffness of the fracture is low; on the right side, bending stiffness is high. The measurement device was calibrated using aluminum bone models, simulating different fracture bending stiff nesses and different degrees of pin loosening. The aluminum model consisted of two aluminum tubes with diameter of 25 mm and a wall thickness of 5 mm. On one side, the tubes were connected by modules of either hard rubber or aluminum, representing different bending stiffness. In each aluminum tube, external fixator pins could be inserted in the same geometrical configuration as the experimental setup. All of the interconnecting modules were tested in four point bending  revealing a bending stiffness of 1.2, 9.1, 22.3 and 30.4 Nm/degree, respectively. Afterwards, the measurement device was mounted on the aluminum model using each interconnecting module separately. Then, apparent stiffness or load/deflection ratio (N/microstrain) was measured in the same way as described above. For every series of measurement datum, a best curve fit using the formula: y = a + b*ln(x+c) was calculated to serve as the calibration function. This function allowed calculation of the bending stiffness (Nm/degree) from the obtained apparent stiffness (N/microstrain). To test the effect of pin loosening, the aluminum tubes were selectively replaced with tubes where the holes of the near cortex were drilled 1 mm larger than that of the pin diameter. This created a model of mild (one loose pin) and the most severe situation of pin loosening (all four pins loose). With each model, identical calibration measurements with each interconnected module were taken, and the resulting load/deflection ratio (N/microstrain) recorded (Fig. 4). Calibration of the in-vivo-measurement device on aluminum model and intact tibiae. Calibration curve of the measurement device obtained from values measured on aluminum bars with interconnected modules of varying stiffness (solid line). The change in measurement (apparent stiffness, y-axis) on the effect of pin osteolysis was determined (◊: All the pins are firmly fixed, ▽: one pin loose, □: four pins loose). For bending stiffness up to 10 Nm/degree, the measurement error remains acceptably small, even under the worst condition of all pins loose. Validation of the calibration model was tested on intact tibiae (green ○). The calculated bending stiffness tends to be smaller than the actual bending stiffness (mean value 5.4%, SD ± 6.2). To test the reliability of the aluminum calibration model in relation to the in-vivo bone model and to determine corresponding accuracy, testing of the measurement device was carried out on seven intact tibiae. The external fixator was applied in an identical geometrical configuration as during the operative procedure. 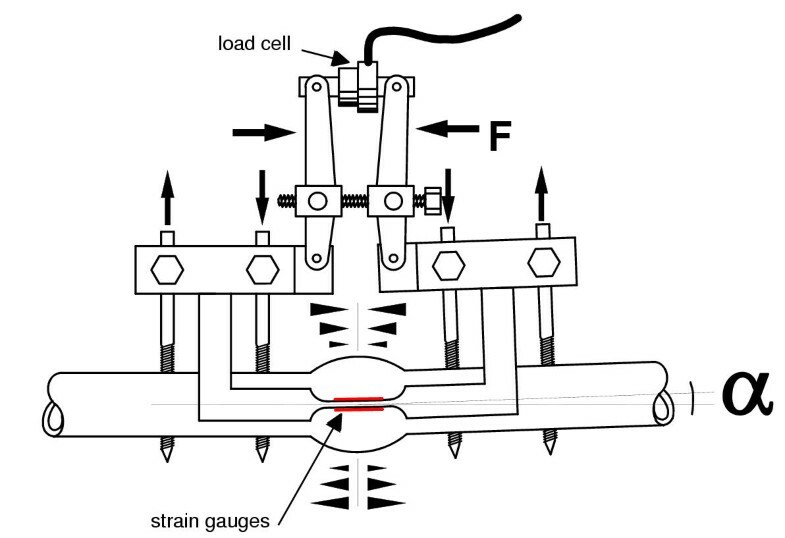 Measurements were made of apparent bending stiffness in the in-vivo-measurement device and measurement of bending stiffness in four point bending (Fig. 4, green points). 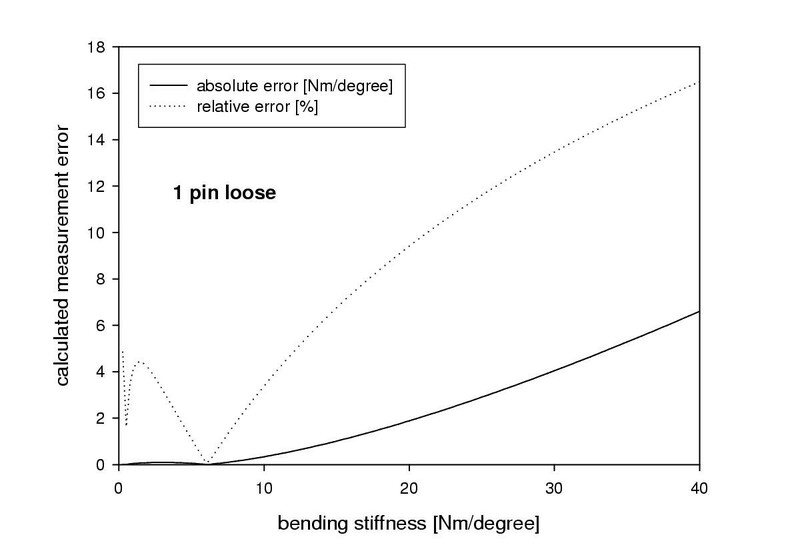 Each value of apparent bending stiffness was calculated by the fitted calibration curve and the values of bending stiffness (Nm/degree) were obtained. The differences between these calculated values and the values obtained from the four point bending test were determined and served as an assessment of the accuracy of the calibration model in relation to the in-vivo-model (Fig. 4, green points and Table 1). Validation of the aluminum calibration model on intact tibiae. Apparent stiffness was measured with the measurement device and actual bending stiffness was calculated. 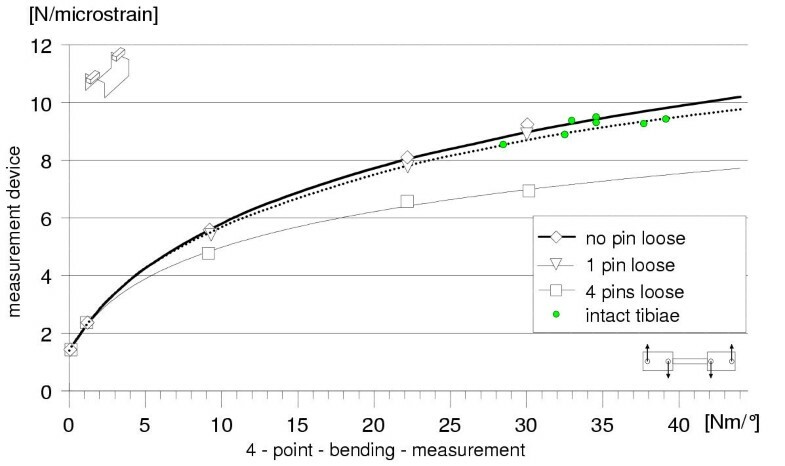 Comparison between the calculated values in relation to the measured actual bending stiffness obtained from four-point-bending gives the error of measurement. There is a tendency to lower values of bending stiffness if measured with the measurement device. The deep frozen tibiae were thawed at room temperature and kept wet using towels soaked in Ringers solution during the whole test period. The embedded ends of the tibiae were inserted into the measurement frame and a non-destructive four-point bending test was performed . The tibiae were loaded at a displacement rate of 10 degrees/minute up to a maximum bending moment of 2 Nm. Each specimen was tested in anterior and posterior orientation, reproducing the bending axis of the in-vivo-measurement device. Angular deformation was measured by a goniometer  directly across the fracture line. To minimize viscoelastic behaviour, the specimens were first loaded with two precycles. For each test orientation, bending stiffness was determined from the slope within the linear part of the load-displacement-curve. 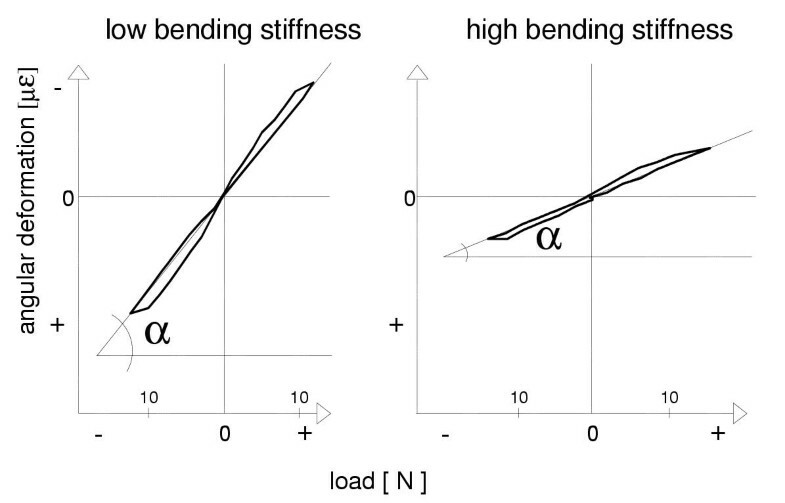 The mean value of both measurements served as the value of bending stiffness. At explantation of the tibiae, the longitudinal bar of the fixator was removed. Pin loosening was assessed manually while repeatedly bending the pins in opposite directions. If only a slight displacement of the pins inside the wholes was felt, it was graded as pin loosening. To obtain calibration curves between apparent and actual bending stiffness, a non-linear regression model was used to find the coefficients of the independent variables that gave the best least-mean-square. To test for an exponential increase in fracture stiffness, linearity of the logarithmic representation of the stiffness data over time was analyzed with a linear regression analysis with a linear fit model using a least squares regression method. The same test was performed to test for predictive values based on the changes in bending stiffness during the first weeks after surgery, in relation to the measured bending stiffness at the seventh and tenth weeks. All these data passed a normality test. The level of significance was set at p < 0.05. All statistical analyses were performed with SPSS – Software (SPSS, SPSS Inc., Chicago, USA). Two weeks after surgery, all of the sheep exhibited partial weight bearing on the operated leg. In two sheep, there was obvious early loosening of the most proximal pin at 6 weeks (Sheep #2 and # 9). In both of these sheep, pin loosening occurred not only on the near cortex but also on the far cortex, resulting in failure of the mechanical measurements. In seven other sheep, at 8 or 9 weeks, measurement of apparent bending stiffness suddenly and unexpectedly decreased markedly, indicating gross pin loosening (Table 2). At 9 weeks, valid in-vivo-measurements could only be obtained from three sheep. Sequential values of bending stiffness for all sheep. Missing values represent pin loosening with failure of the measurement device. Values at ten weeks were measured in the four-point-bending test machine (4-p-b). Bending stiffness of the contralateral intact side was measured in the identical plane. The manual evaluation of pin loosening at explantation of the tibiae showed a loosening of 36 out of a total of 48 pins. In all sheep, the most proximal pin was clearly loose. The number of loose pins decreases from the most proximal to the most distal pins (12, 9, 8 and 7 loose pins, respectively). y = -3.211 + 3.319*ln(x+4.449) (p < 0.001, multi r2 = 0.999). y = -0.995+2.285*ln(x+3.311) (p < 0.01, multi r2 = 0.998). Generally, in case of pin loosening, the apparent measured values are lower with increasing bending stiffness of the fracture. Analysis of the measurement error calculated from the fitted curves was found to be in the range of 0 to 16.5% for one pin loose (Fig. 5) and the range of 0 to 51.4% for four pins loose (Fig. 6. In the range of lower values of bending stiffness, representing the early phase of healing up to 10 Nm/degree, measurement error was below 3.4% for one pin loose and below 29.3% for four pins loose. Calculated measurement error in case of one pin loose. The calculated absolute and relative measurement errors obtained from the aluminum calibration model increases with higher bending stiffness. If actual bending stiffness is below 10 Nm/degree, the measurement error is below 3.4%. The observed non-continuous increase of measurement error in the lower part of the curve is related to small variations of the calculated curve-fit model, and not to systemic changes. Calculated measurement error in case of four pins loose. Measurement errors in case of four pins loose. Below 10 Nm/degree, the error remains below 29.3%. The accuracy of the aluminum calibration model with respect to the bone-fixator composite revealed rather lower values of bending stiffness if measurement was performed on the intact tibiae (Fig. 4, green points). The mean error of measurement between the calibration model and intact bone was 5.4% ± 6.2 (Table 1). Weekly in-vivo-measurement of bending stiffness in all sheep showed an increase in bending stiffness from the second week onwards (Fig. 7). The increase in bending stiffness at the third week varied among individual sheep (Table 2). Each sheep had its own characteristic curve, representing its individual healing pathway. In none of the sheep could any interference of this healing course with respect to mechanical changes be observed. All curves showed a continual increase in bending stiffness up to the tenth week. At the end of the observation time, the difference in actual bending stiffness was large, ranging from 13.3 Nm/degree up to 43.1 Nm/degree. 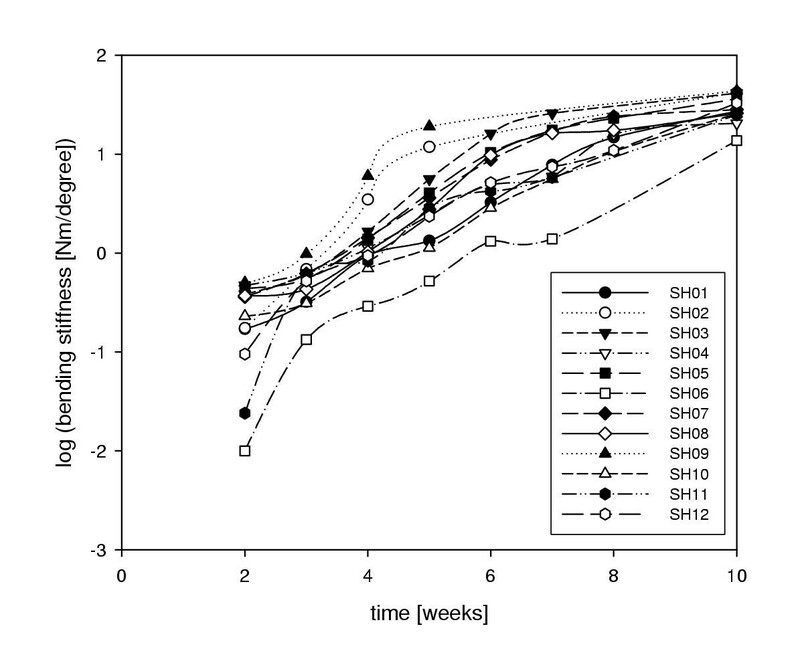 Logarithmic transformation of the stiffness data showed a linear increase of fracture stiffness between the third and the seventh weeks, whereas data values at the second week did not yet give predictive information on the course of healing (Fig. 8). Testing of the logarithmically transformed linearity data (linear regression test) showed a high correlation coefficient for all sheep (mean ± standard deviation: r = 0.950 ± 0.037, Table 3). Therefore, the assumption of logarithmic stiffness increase can be confirmed. The healing rates shown by the fitted lines of the transformed data were tested by using the gradient of the best fit lines in relation to the measured stiffness at 7 and 10 weeks, but did not show a significant linear relationship (Table 4). The slope of the fitted line of the transformed data can therefore not be assumed to be an early indicator for healing. The slopes of the transformed data between the third and the seventh weeks rather tend to be parallel and converge after the sixth week (Fig. 8). However, the intercept of the fitted line of the logarithmic data reveals a significant predictive value of future bending stiffness (Tab. 4). In conclusion, the rate of healing in the logarithmic data representation among individual sheep, was similar, but started at different levels from the third week on. Sequential stiffness measurement. Increase of callus bending stiffness versus healing time of all sheep. From the third week on, fracture stiffness is obviously increasing. All stiffness values at ten weeks were obtained from four-point-bending tests in a material testing machine. Note that the curves of the in-vivo-measurements closely correspond to the more accurate ex vivo measurements obtained from the 4-point-bending test. In those sheep where progressive pin loosening was evident, the data points were omitted. Logarithmic presentation of actual bending stiffness over time. Logarithmic presentation of the bending stiffness of all sheep showed a linear increase between the third and the seventh week, converging to the tenth week. The curves showed rather similar slopes, but started at different levels at the third week. * not significant. A linear regression analysis of the logarithmic transformed bending stiffness data versus time. Statistical data are represented in the above table. In all but one sheep, the transformed data showed a high degree of linearity, confirming the logarithmic increase of bending stiffness over time. Statistical data obtained from linear regression analysis. Future development of bending stiffness can be estimated from the third week on. The best predictive value at the seventh week is obtained from the change in bending stiffness between the third and the fourth week. Prediction of stiffness at the tenth week can best be estimated from change in fracture stiffness between the fourth and fifth weeks. Linear regression analysis of logarithmic transformed stiffness data versus time revealed that predictive values can be obtained from the intercept of the fitted line rather than from the slope. Linear regression analysis between early changes in bending stiffness and its prediction on the progress of healing revealed significant dependencies (Fig. 9, Fig 10 and Table 4). 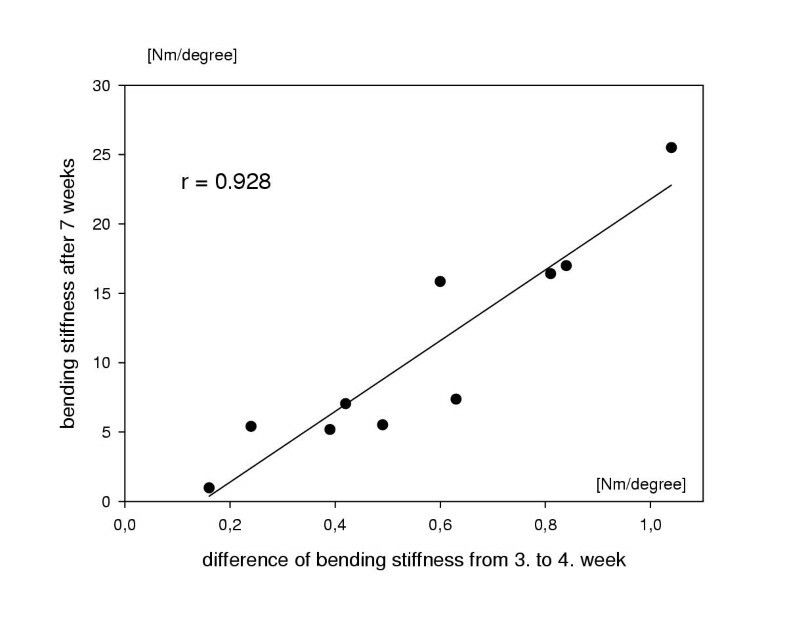 The highest significant correlation was found in the change of bending stiffness between the third and fourth weeks, and fracture stiffness at the seventh week (r= 0.93, p < 0.001, Fig 9). Still, a strong correlation was found when predicting stiffness at the tenth week (r = 0.71, p = 0.01, Fig. 10). Other dependencies were found to be of lower correlation, as summarized in Table 4. Predictive values of bending stiffness at 7 weeks. Individual changes of bending stiffness between the third and fourth weeks have a very strong correlation with the measured value of bending stiffness at seven weeks. Two sheep showing early pin loosening were excluded due to missing values at the seventh week. Predictive values of bending stiffness at 10 weeks. At 10 weeks the correlation of the predictive value is lower compared to the seventh week but still revealed a strong correlation. Notice the logarithmic scale of the x-axis. In a fracture stabilized by external fixation, axial and bending stiffness can be measured by attaching measurement devices to the external fixator pins or longitudinal bars. However, in measurement of axial stiffness, there are three main limitations. First, the measured axial force recorded from the force plate is not necessarily the effective axial vector of the force, and therefore can result in measurement errors. Second, pin osteolysis has a severe influence on the measured value of stiffness, erroneously indicating a higher stiffness  and can be difficult to detect. Third, if the fragment ends are in contact, measurement of axial stiffness is impossible, due to dynamic load transfer through the connected bone ends, which leads to erroneous higher fracture stiffness values. By way of contrast, the assessment of bending stiffness is insensitive to bone contact and has been found clinically to be best suited to the assessment of fracture healing [27, 30]. Available methods to determine bending stiffness use either a straight-leg raise test or a bending test supporting the heel. Due to the indirect application of load, the resulting bending moment at the fracture site often only is an approximation, and can often only be used as a consecutive measurement for each patient. As opposed to these methods, our custom-made measuring device produces a direct bending moment on the bone fragments, thus simulating a four-point-bending test with a constant bending moment created between both innermost pins. During measurements, the pins are loaded mainly in an axial direction, transferring the load directly to the bone fragments. The bending deformation applied is minimal, with no obvious danger of destroying the newly formed interfragmentary tissue. To obtain values of bending stiffness in Nm/degree and to get comparable results among individual fracture, calibration of measurement systems on modules with known bending stiffness is required. As in other systems [16, 20]. the calibration curve of our system showed that there is a non-linear relationship between applied load and measured bending stiffness. This finding is not surprising, due to the inherent bending stiffness of the measuring device and the increasing deformation of the pins with higher fracture stiffness. This instrument measures not only the callus stiffness, but also the compound stiffness of the callus+construct. A linear increase in fracture stiffness leads to a non-linear response in the strain/deformation relationship. Since the fracture stiffness is low, a small increase of stiffness results in a large change in the calculated stiffness factor. Therefore, without calibration, measurements represent a predicted increase in stiffness that may not actually exist. Finally, the bending stiffness of the interconnecting bars was reduced to enhance the sensitivity of the device. However, we purposely did not try to minimize the inherent bending stiffness of the instrument because it had to maintain the reduction and the fixation during the measurement. Testing the validity of the calibration on intact sheep tibiae revealed a rather lower calculated bending stiffness, 5.4% ± 6.2 (mean +/- SD). However, calculation of the error was deliberately done on intact tibiae, representing a high value of bending stiffness. As a result, it can be assumed that the error of measurement below these stiffness values is even smaller, and the accuracy of the system is highly acceptable . In previously described measurement devices, it was found that pin loosening may result in a large measurement error. For example, , showed an error of 20% for one pin and 50% for two pins loose. Compared to this, our device showed smaller errors, below 16.5% of the stiffness value for one pin loose, and 51.4% for all four pins loose. In the range of lower actual bending stiffness of up to 10 Nm/degree, a value which can be assumed to be the healing threshold of a sheep tibia, the error of measurement was much smaller, showing errors of 3.4% and 29.3% in case of one or four pins loose, respectively. Other investigations, calculating the errors on probes with equal bending stiffness of 10 Nm/degree, found errors of 22% for intentional errors and additional general errors of 20% . The lower error of our device, in comparison to the conventional method, can be explained on the basis that loading simulates four-point-bending exerts a force mainly along the screw axis, and rather less bending force perpendicular to this axis. If the pins loosen completely, it is obvious that either measurement device will fail. For the conventional method of measurement, which assesses the amount of stress passing through the external fixator, it might appear that the fracture stiffness had increased. This would be an erroneous interpretation, due to the fact that pin loosening had occurred, with a consequent increased load transfer through the bone and the callus. However, in our measurement device, pin loosening can be detected by an unexpected decrease of bending stiffness. This condition was identified in 7 out of the 12 sheep used in our experiments. In a majority of the sheep this phenomenon was seen from the eighth week on. The ex-vivo four-point bending stiffness test revealed that the in-vivo measurements were valid, because the post mortem stiffness values fell on the expected curve of the healing pattern. The serious problem of pin loosening was also confirmed, 36 out of 48 pins showed a clear sign of loosening. Pin loosening rates reported in the literature of, 40 %  and 42% , are considerably less than the 75% in our work. We explain this difference on our careful observation that detected small signs of loosening on the near cortex, which we judged to be due to pin loosening. However, the question arises of for how long should bending stiffness be measured in order to have sufficient evidence to assess fracture healing? During the first weeks after operation, pin loosening can assumed to be a minor problem. Different investigators were able to show that in tibial fractures a bending stiffness of 15 Nm/degree is sufficient to permit removal of the external fixator [17, 34]. No fracture reaching this value showed a refracture or malalignment. Therefore, 15 Nm/degree is judged to be the value at which the fracture has healed. Assuming an intact human tibia to have a bending stiffness of 60 to 100 Nm/degree ( and own unpublished measurements), 15 Nm/degree represents 15 to 25% of the value of the intact tibia. In sheep tibia, the 25% value corresponds to a bending stiffness of 10 Nm/degree, which is reached after six to eight weeks in our experiment. Pin loosening in our experiment obviously started after the eighth week, when most of the sheep showed a bending stiffness of more than 10 Nm/degree. Therefore, up to this value, the measurement error was below 3.4% and 29.3% for one and all four pins loose, respectively. Consequently, measurements in the first seven weeks of the experiment can assumed to be reliable. 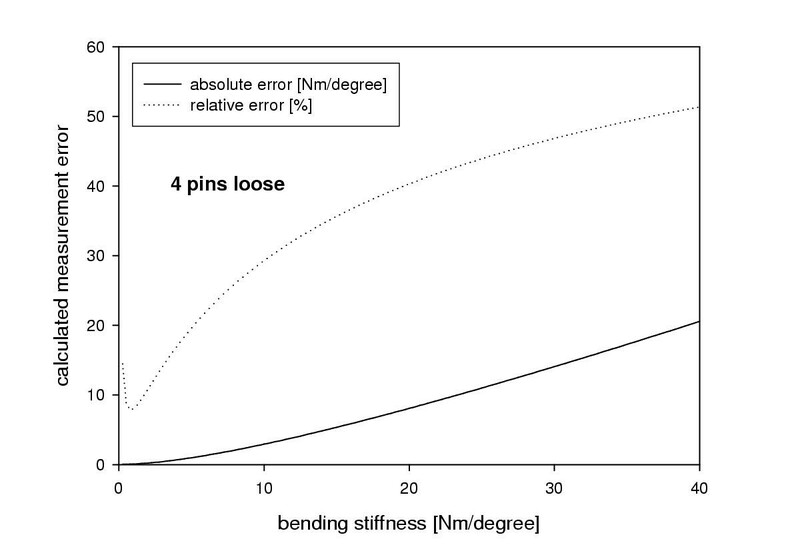 In the later phase of healing, when pin loosening was obvious, a correction of the apparent stiffness values could be made by the calibration curves. However, the number of slightly loose pins of the individual sheep that may have influenced the measured value is not known. Therefore, a correction of the apparent stiffness value has not been done. 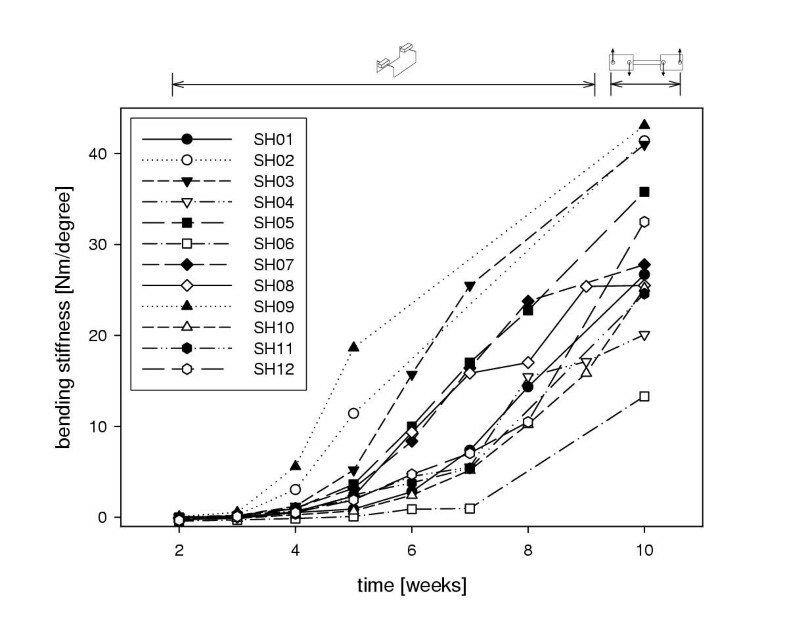 Each sheep showed an individual healing pathway with respect to bending stiffness versus time. In all sheep, bending stiffness was low up to the fourth week, giving the impression that not much healing occurs up to this time. Thus, prediction of good results based on an early increase in fracture stiffness obviously can not be made. However, analysis of the logarithmic increase of actual bending stiffness has been shown to be significant. These data showed a linear increase of actual bending stiffness between the third and seventh weeks (Fig. 8). Interestingly, expected differences in the slopes of the individual logarithmic stiffness data were not found. Instead, there were significant differences found in the third week initial stiffness values (Fig. 8 and Table 3). From our experimental data, no obvious predictive value of future bending stiffness could be made at two weeks, but calculations based on the differences between individual sheep from the third and fourth weeks showed a very strong correlation (r = 0.928, p < 0.001) with regard to the stiffness that was found at the seventh week. Still, there was a strong correlation found, with the changes between the fourth and fifth weeks, predicting stiffness at the tenth week (r = 0.765, p = 0.004). These findings allow us to conclude that the initial biomechanical and biological conditions at the fracture site essentially influence the individual healing path, as has been alluded to in previous investigations [23, 27]. We found that prediction of the healing path can be made between the third and fourth weeks, a phase in which the actual bending stiffness is still low (< 3 Nm/degree). Actual bending stiffness can be measured in-vivo without loss of reduction and interference with fracture healing. With our measurement device, errors due to pin loosening remains small, especially in the interval up to 10 Nm/degree, representing 25% of the intact tibia. The measuring device provides a sensitive method of measuring actual bending stiffness, even in the early phases of callus healing. Bending stiffness showed a logarithmic increase over time. However, in logarithmic representation, the slope of the bending stiffness is similar among individual sheep, but started at different levels from the third week on. Early changes in bending stiffness showed a significantly strong correlation with the measured stiffness value at seven and ten weeks, and can therefore be used as a highly predictive value. Measurement of absolute values of bending stiffness (not only relative increase between measurement intervals) of the healing fracture is possible. Measurements taken at weekly intervals can very early predict the possible occurrence of a delayed union or pseudarthrosis, thus initiating the appropriate corrective treatment, i.e., bone graft or secondary conversion to, e.g., intramedullary nailing. It is important to predict bone healing or its absence early: On the one hand, it seems possible to establish if there is a risk of delayed union, before it actually occurs. On the other hand, when the callus reaches its plateau value with a rapid increase in stiffness, it should be possible to recommend fixator removal before pin loosening leads to infection. This measuring technique is therefore not only of scientific interest, but also of considerable benefit to the patient. Author 1, RH designed the experiment, carried out the experimental work, performed the main calculations and drafted the manuscript. Author 2, JC supported the design of the measurement device and participated in the mechanical analysis. Author 3, SMP participated in the design of the study and its coordination. We would like to thank the collaborators of the Laboratory for Experimental Surgery, Davos, particularly the operating team, the animal caretakers and the mechanics who built the measuring instruments.